Alphabet Pony: INDEPENDENT EP/VIDEO RELEASE: Monique Angele, "Alive" and "Hold On"
INDEPENDENT EP/VIDEO RELEASE: Monique Angele, "Alive" and "Hold On"
The cover to Canadian singer Monique Angele’s EP “Alive” (Above) shows her sitting alone in an antique armchair near a tiffany lamp. She turns her head to her right, as if someone on the other side of the room has just said something worrisome. It’s a remarkable picture for an EP cover and I don’t normally comment on covers. (Maybe I should.) The Polaroid-esque tension of the image makes the perfect pre-introduction to her 6 track release. 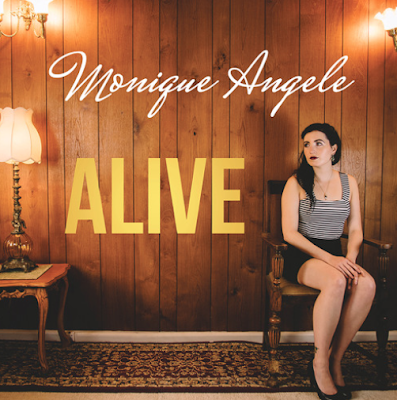 Angele injects a lot of emotion into her songs but never shouts. Her songwriting is precious but without stealing anything from Kate Bush. The first track is “Pink Colored Sky,” backed by what sounds like an orchestra in a room where the wood on the walls is fake but beautiful anyway. “Oh, I dream of pink-colored skies where there are no limits,”she sings. “Seeing things I don’t want to see, feelings things I don’t want to be…”Her voice is beautiful and strong enough to carry such lyrics, thankfully. Words that would weigh too heavy in a lighter voice. Based in Australia now, Angele has a background in solo piano and voice repertoire as well as opera and musical theatre. “Rare Girl,” my favorite track, continues to show off what a talented pianist and vocalist Angele is. Each song is, in fact, started then held together by the rhythm and value of her piano playing. She sings here about the universal need to be that rare girl, the one who always has it all together. “Hold On” has a music video which I’ve included below. The video dissolves between her hands playing the piano, Angele reclined before a white sheet curtain, and a frontal shot of her playing the piano and singing, swarmed in lens glare. “Time will tell when I’m fine,” she sings, later walking in a white dress through a high-grass field. Her superimposed profile sings: “I’m broken now, I’m broken now” over an image of her continuing to walk, actually appearing pretty broken now. “I’m not me, I’m not me…” The song builds with choral background singers. The video ends with Angele reassembling a broken mirror in slow-motion, intercut with her atop a large hill, the chorus still swelling, ultimately victorious. The EP ends with “I Want A World” in which she just wants a world where people are kind. She wants a world where she can breathe clean air. “…where we never leave nature in despair.” We all want that, but sadly we haven’t a damn clue.